2 nights Dorm Share accommodation in central Airlie Beach. Meet other travellers in comfortable multi-share room, all with ensuite and air-conditioning, the hostel accommodation is set amongst tropical gardens with an outdoor swimming pool right in the heart of Airlie Beach. Only 50m to the lagoon, the cafes, bars and shops are on the doorstep and the marina is just a stroll away. 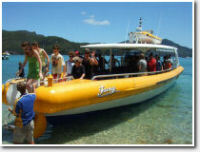 1 day exploring Whitehaven Beach and snorkelling the Whitsunday Islands. Get there before the crowds aboard one of the Whitsundays most exciting rides, Big Fury. We take you to Coral Reef Sites in comfort and at a third of the travel time of some other boats. The first stop is the amazing Whitehaven Beach, where you can enjoy 2/3 hours of swimming, relaxing or strolling along the 7 kms of pure white silica sand and enjoy a buffet style picnic lunch served right on the beach! Be then taken to a superb island reef site where you will enjoy snorkelling amongst tropical fish and coral just metres from the islands � snorkelling equipment included. Includes morning tea, lunch, and afternoon tea, snorkelling equipment and courtesy pick up and drop off from local holiday accommodation.